Every music festival, of course, features lots of music. How many, though, have music education as a central part of its mission? Thanks to the talents of a 25-member team of music educators, led by Leila Ramagopal Pertl and Brian Pertl, Appleton’s Mile of Music is one such festival. 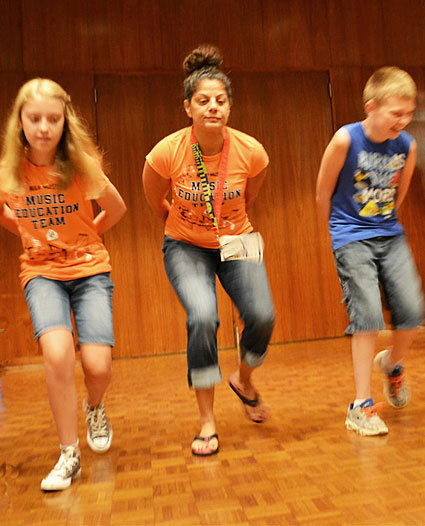 Leila Ramagopal Pertl (center) leads a gumbooting workshop, one of more than 40 music education events at the annual Mile of Music festival in downtown Appleton. 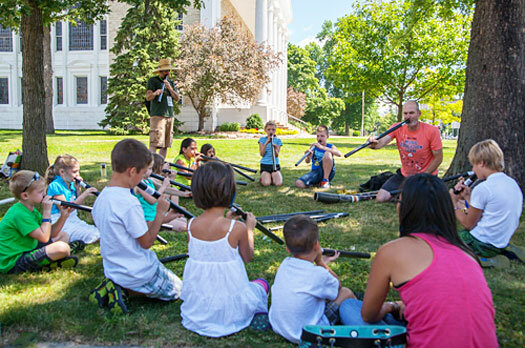 More than 40 hands-on music education workshops, ranging from Ghanaian drumming to ballet, will be conducted Aug. 3-6 during “Mile 5” of Appleton’s Mile of Music festival, a celebration of original, handcrafted artisan music. This year’s festival features nearly 900 live performances by more than 225 artists from 28 states and three countries representing virtually every music genre at 70 venues along College Avenue and the Fox River. Beyond the concerts and artists featured at Mile of Music, as always, Mile 5 will feature plenty of hands-on, participatory music education events. Ramagopal Pertl’s enthusiasm is obvious when she talks about the results of past Mile of Music education workshops: the person who started playing an instrument again; the person who wrote their first song or formed a band, the person who discovered Irish dance and now is in their third full year of learning Irish dance, the person who produced their own CD of songs. Brian Pertl, dean of Lawrence’s conservatory of music, joins his wife Leila in leading the music education team. He is excited about the expanded opportunities this year’s festival offers. “Last year we debuted the P-bone jam, hip-hop workshops, the Building for Kids Immersive Music Day, vocal workshops, ukulele workshops, the NAMI Panel on the Power of Music and Mental Health and we expanded our deep listening activities,” said Pertl. A didjeridu workshop led by Brian Pertl, dean of the Lawrence conservatory of music, has been a staple of the music education program of the annual Mile of Music festival. Among the dedicated team of music educators assisting the Pertls are 16 workshop leaders with ties to Lawrence. In addition to the education aspects of Mile of Music, Lawrence will be represented on the performance side. Among the groups performing, one group with a number of representatives is Porky’s Groove Machine. An all Lawrence alumni band, Porky’s Groove Machine performs four times during the festival, including twice on the festival’s opening day — Thursday Aug. 3 at 10 p.m. on the Mile of Music bus and again at 11:50 p.p. at the Gibson Music Hall. They return to the stage Friday Aug. 4 at 8:50 p.m. at the Radisson Paper Valley Grand Ballroom and Saturday Aug. 5 at 7:10 p.m. at The Alley Project. The third installment of Lawrence University’s 2016-17 convocation series will celebrate the musical and educational career of Professor of Music Janet Anthony in a rare evening presentation. Anthony presents “Adventures in Music Making: 20 Years of Cross-Cultural Exchange in Haiti” Friday, Jan. 6 at 7 p.m. in the Lawrence Memorial Chapel. The event, free and open to the public, also will be available via a live webcast. Anthony, the George and Marjorie Olsen Chandler Professor of Music, was chosen as the co-recipient of Lawrence’s annual Faculty Convocation Award, which honors a faculty member for distinguished professional work. 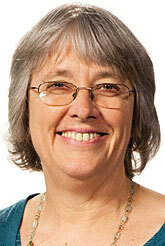 She is the eighth faculty member so honored. A cellist who joined the Lawrence conservatory of music faculty in 1984, Anthony has been making annual trips to Haiti since 1996 to conduct, perform and teach at music schools there. 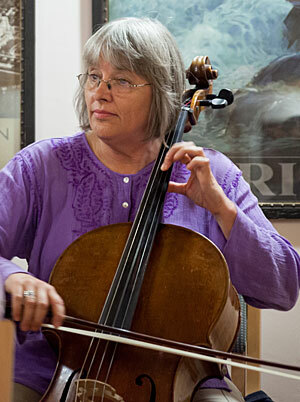 Since making her first trip, more than 50 Lawrence students and faculty colleagues have accompanied her to teach in some of the many music programs with which she has been involved. Anthony also has assisted in bringing key Haitian music teachers and students to the United States for short-term professional development. Following the devastating 2010 earthquake that devastated parts of the country, Anthony helped organized a benefit concert in Appleton for Haiti and collected needed supplies for the survivors, including gently used instruments. She has since performed numerous memorial concerts in Haiti, including one in 2011 on the one-year anniversary of the earthquake. Anthony is the co-founder and current president of Building Leaders Using Music Education (BLUME)-Haiti, a Fox Cities-based nonprofit organization that works with Haitian and International partners to develop and support music education for youth and young adults in Haiti. Desrosiers, an Appleton native who has made multiple trips to Haiti with Anthony, co-produced and co-directed a documentary film — “Kenbe La” — which explores the transformational power of music programs in Haiti. An active soloist, recitalist and chamber musician, Anthony has toured with the Vienna Chamber Orchestra, the Austrian Radio Orchestra and the Chamber Orchestra of the Vienna Symphony. She also has performed or taught in Argentina, China, Curacao, Japan, Venezuela and Vietnam and, as a member of the Duo Kléber, she has performed in England, France, Italy and Bosnia Herzegovina. A frequent performer on Wisconsin Public Radio, Anthony earned a bachelor’s degree from the University of Arizona and a master’s degree in music from the State University of New York at Stony Brook. She also studied at Vienna’s famed Hochschule für Musik und Darstellende Kunst.